Afghan Engineer Has Kalashnikov, Will Invent Afghanistan has a real-life version of Doc Brown, the kinetically hyperactive and clever inventor in the Back to the Future movies. Supporters say his gizmos — such as burglar and car alarms — could help fight crime in Afghanistan. 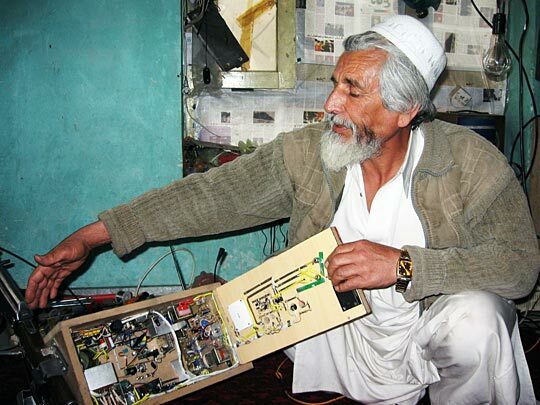 Afghan inventor Hanif Molavizadeh, an unemployed electrical engineer, describes how his homemade burglar alarm works. 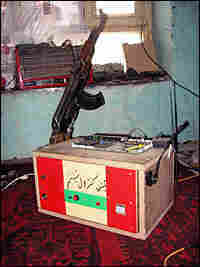 Molavizadeh's burglar alarm is armed with a Kalashnikov. 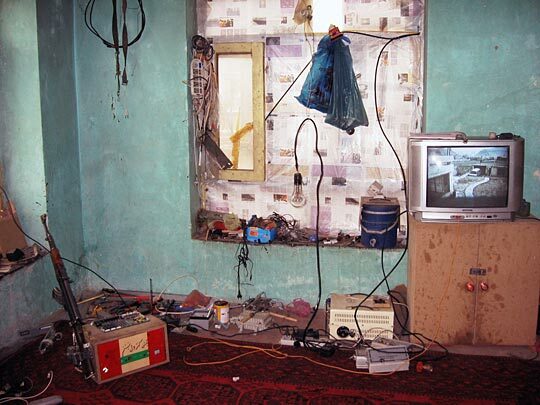 The floor of his one-room home serves as Molavizadeh's workshop. Afghanistan has a real-life version of Doc Brown, the kinetically hyperactive and clever inventor in the Back to the Future movies. 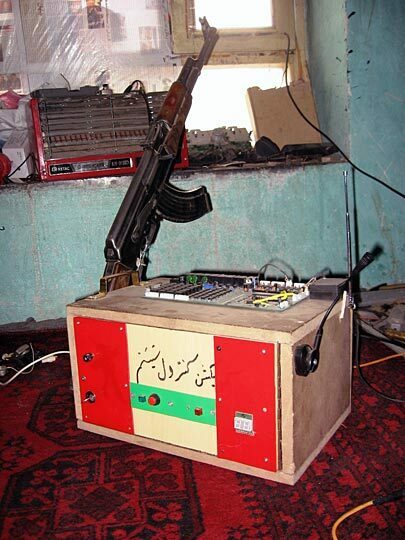 Like his fictitious counterpart, Afghan inventor Hanif Molavizadeh isn't widely lauded for his odd creations. 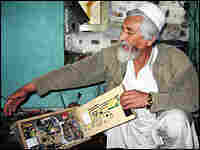 But supporters believe his inventions could help fight growing crime in Afghanistan. Take, for instance, his homemade burglar alarm. 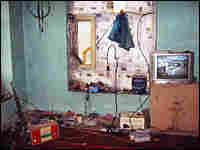 With its urgent ticking, the alarm in a wooden box almost seems to dare someone to try and break into Molavizadeh's one-room home, which doubles as his workshop. A simple wave of the hand outside the window triggers the alarm's motion detectors and sets off a song-like warning. An automated voice warns there is an intruder. The contraption then calls Molavizadeh's cell phone. He says he can receive the automated warning from up to four miles away. He shouts "Hello, who are you?" into his phone, and the sound of his voice is transmitted and broadcast through the alarm box. If that's not enough to stop a would-be burglar, he says, then remote-firing the Kalashnikov attached to the wooden box should do the trick. But sometimes inventors, including Molavizadeh, an unemployed electrical engineer bursting with nervous energy, have to work the kinks out of their creations. The 60-year-old inventor says that last month, he forgot to unload the gun while testing the alarm. A bullet broke a window and ricocheted off a neighbor's wall. His neighbor, a police officer, wasn't amused. But another neighbor and friend, lawmaker Aref Nourzai, was so impressed with the device that he had Molavizadeh make one for his home. Without the Kalashnikov, that is. Nourzai says he wants to give the inventor a workshop and provide him with materials. "We've got a lot of undiscovered, talented people like him, and if they see this guy being supported and motivated, maybe they'll step forward," he says. A homemade burglar alarm may not sound exciting to American homeowners, who have their pick of alarm companies. But in Afghanistan, where there are no alarm companies and police can be unresponsive, the armed, talking red box could well become a blockbuster. Molavizadeh has also invented a car alarm that emits what he describes as a painful but non-lethal electric shock. If an intruder doesn't heed an automated warning, the vehicle's owner can — by pressing a button on a cell phone — punish the would-be-thief with a jolt. The local police requisitioned the car alarm, and the inventor says he delivered it to them four months ago. But a police official tells NPR it still hasn't been tested. Molavizadeh isn't surprised. He says Afghan authorities don't take him seriously. "If they gave me official permission to build these things and funded it, I'd be able to do so much," he says. Nourzai, the lawmaker, says it's a shame the government isn't paying more attention to Molavizadeh, who has been featured on local television and in Afghan newspapers. He likens the inventor to Afghanistan's untapped mineral wealth, which the government has done little to exploit. "If nobody extracts them, nobody makes use of them, we won't progress," Nourzai says. He says he plans to fund Molavizadeh's work as best as he can, giving him $200 or so a month to keep him afloat.